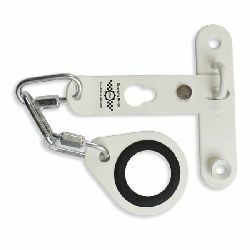 The Secure-Ring Door Security Chain is the ideal door chain for uPVC and composite doors which would be compromised by any type of screw fixing. It can be used with any type of door which has a suitable door handle. 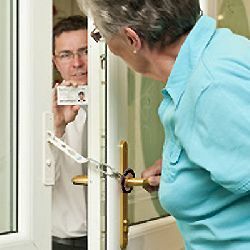 Opening the front door to strangers can be an unsettling and sometimes frightening experience, especially if you`re elderly, isolated, vulnerable or infirm. 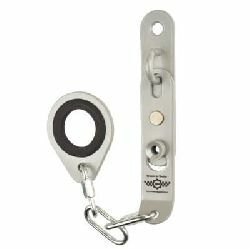 A door security chain for uPVC or composite doors can help provide the security that is needed. Secure Ring is a totally new concept in door chains and is helping in the fight against distraction burglary. It was designed with the customer in mind and as a result has a number of unique features. 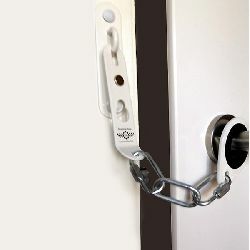 Although the Secure Ring door chain has been designed primarily for use with uPVC or composite doors, the integrity of which would be compromised by screwing anything into or on to them, the product can be used effectively with any type of door with a suitable door handle. Secure Ring has been tested to withstand extreme forces (up to 500lbs of pressure and 11.5 stone striking force), making it virtually impossible to break through. The product has achieved the coveted Secured By Design Accreditation from ACPO (Association of Chief Police Officers) and its universal design makes it suitable for use with left handed or right handed doors. Secure Ring helps to prevent distraction burglary and door step crime as it allows people to see who is at the door before allowing entry to their home, making it the ideal product for victims of crime, domestic abuse victims, elderly and vulnerable people, etc. Fixing Panel Size (H) 188mm x (W) 25mm x (D) 2mm.